ix + 233 pp., 104 illus. The Mazique site (22Ad502) is a late prehistoric mound and plaza center located in Adams County, Mississippi. Previous archeological collections identified both Coles Creek (AD 750–1200) and Plaquemine (AD 1200–1650) components, making Mazique an ideal vantage from which to inspect the changes wrought by the Coles Creek/Plaquemine transition. The primary objective of this research was to determine which model of Plaquemine origins best accounts for the circumstances observed at this civic-ceremonial complex and in the Natchez Bluffs region: the External Stimulus model or the Internal Development model. In 2012 and 2013, members of the University of Alabama’s Gulf Coast Survey shovel-tested nearly 13 acres of the site and excavated another eight contexts. 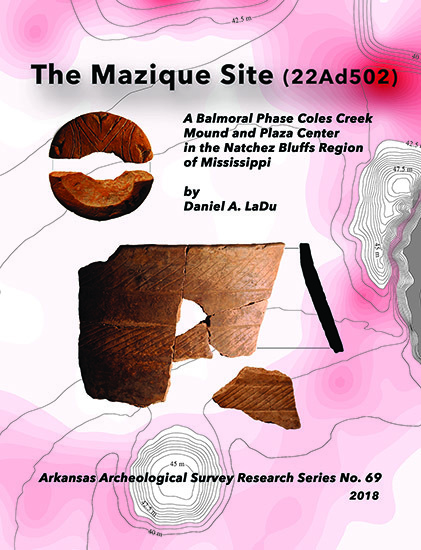 The results presented herein reveal that Mazique is a remarkably complete Balmoral phase (AD 1000–1100) mound and plaza complex that was abandoned during the Gordon phase (AD 1100–1200) and experienced only ephemeral Plaquemine reoccupation during the Mississippi period (AD 1200–1650). When the intrasite circumstances observed at Mazique are considered from the intraregional scale of the Natchez Bluffs and the interregional scale of the Coles Creek/Plaquemine heartland, it is apparent that neither External Stimulus nor Internal Development offers a unifying explanation of Plaquemine origins. However, instead of representing antithetical theoretical positions, I believe that External Stimulus and Internal Development actually express complementary forces at work within a broader network of contact and communication, and that the Coles Creek/Plaquemine transition is more aptly modeled as the convergence of the Coles Creek and Mississippian interaction spheres.